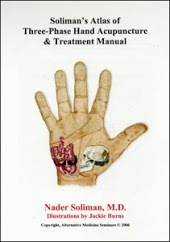 Three-Phase Hand Acupuncture Atlas & Treatment Manual – Nader Soliman, M.D. Comes in 2 convenient sizes! Three-phase hand acupuncture introduced by the Dr. Nader Soliman few years ago, is a more practical approach to treat pathological disorders with greater accuracy. Three-phase hand acupuncture enables practitioners to address the pathophysiology regardless of the duration or the intensity of the pathology. KHT offer only one phase that is suitable for treating acute medical problems. Conversely, Soliman’s three-phase hand acupuncture offers two additional phases to treat both chronic and chronic degenerative pathology. Soliman’s three-phase hand acupuncture atlas offers visually pleasing color illustrations to make understanding and utilizing this system a very easy task. The atlas also offers a treatment manual to help guide practitioners to address any pathology in the most effective way. This high quality, spiral-bound Atlas greatly enhances the teachings of Dr. Soliman’s three-phase system. This atlas contains 52 detailed, color illustrations, with projections for the various organs and structures. Also included are 13 pages of treatment suggestions. Spiral-bound, 8.5” x 11.5”, 65 pages. Now, you can have Soliman's three-phase hand therapy atlas with the convenience and portability of the pocket-sized version!